Williams Automotive can help if you have problems with your car air conditioning system. We have a state of the art new AC machine that is able to complete a full service on your ac system. We can help if you have a leak with our electronic leak detector and the use a vacuum test from the machine to identify the leak. 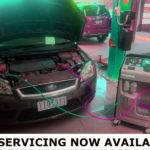 We are accredited from ARC (Australian Refrigerant Council) to under take AC repair and service work on your vehicle. If your heater is blowing out hot air or the air con just not working we are here to help.